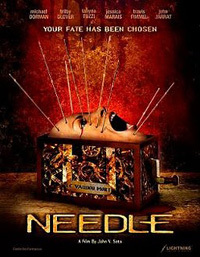 Needle is an Aussie horror flick going for the classic and well-trodden path of a group of students systematically being knocked off. One of these youngsters received a mysterious box from his passed father's estate. This happens to be an evil little device working much like the voodoo doll myth. With his estranged brother arriving on the scene, they need to get to the bottom of the grisly killings before everyone's done for. Passable if you're not feeling very particular when it comes to consuming just under 90 minutes of rather generic horror.